A major output of an FMEA study is an inventory of potential failures, ranked from the highest to lowest risk. That list, rich with opportunities for improvement, can lead to important risk mitigation making processes and products more robust and safe or it be filed away and ignored. Often, the difference is in how the findings are presented to the executive team. Senior managers are busy and their time to focus on any one thing is limited. It is up to the FMEA team to make sure their findings get attention and traction with a succinct and compelling FMEA Executive Summary. Succinct. Compelling. Never forget that these are crucial if you want your findings to get the attention and support it deserves. The scope of the FMEA. Who was involved with the FMEA and the time frame it was done in. Listing of the highest risks identified along with supporting information. Recommended (or completed) action plans. 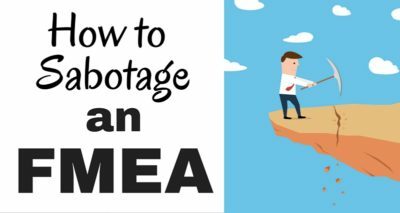 Suggestions for leveraging the FMEA study. The scope is easy! 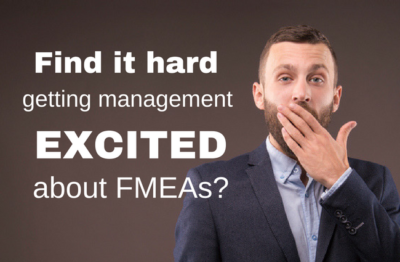 It was defined at the beginning of the FMEA, often by the management team. Make sure to include any changes made to the scope once the team got into the actual project. If there was a scope change during the project, you should also explain that here – in one sentence. Identify the members of the FMEA team as well as outside resources who helped throughout the FMEA process. Define the timeframe of the FMEA so that information is part of the official record for the project. 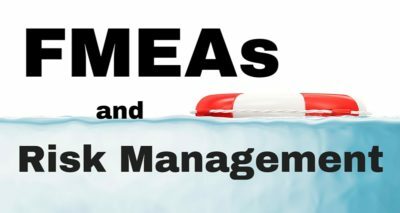 Most FMEAs uncover dozens of risks so this is a great place for some graphs that make it easy to see all of the risks and quickly pick out the most critical. A visual way to do that is in an FMEA Executive Summary is to use an ordered bar chart. In the simplified example shown here, we have five potential failures. (Note: A real FMEA will have dozens of potential failures). The graph above is the same information as in the table, but the data, in the form of a picture (an ordered bar chart in this case) may resonate more with your executive team. Although you will have many potential failures, there is no need to put them all on a summary graph; the full data with be included in your full report. 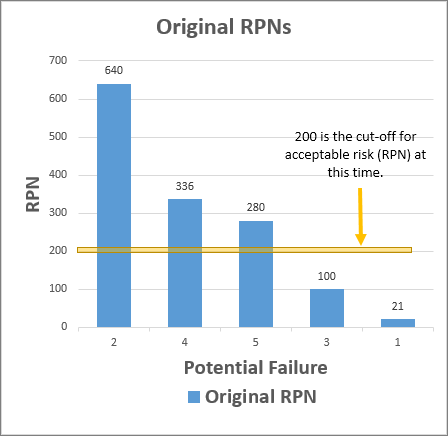 Let’s assume for this example, that any risk with an RPN of greater than 200 is an unacceptable risk. Since risks that are below 200 aren’t going to be worked on at this time, consider leaving them off. Executives aren’t interested in minutia; they just want to be aware of the big problems. With the list of the potential failures requiring action identified, indicate the recommended action. 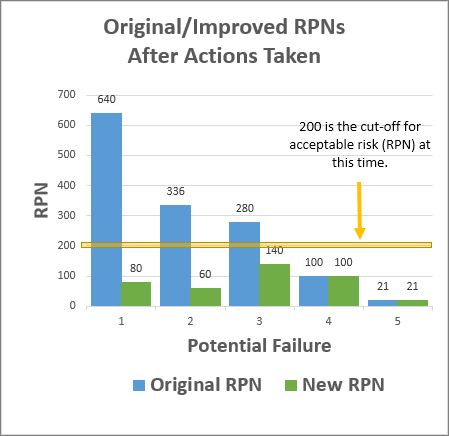 If the team was also responsible for developing action plans to reduce the RPNs of those items, describe the action taken for each along with the newly updated RPN. Show the original and new RPNs in graph form. Often improvements made on a process or design can be used in other, similar processes or can be shared with other business units in the organization. This helps get even more benefit from the time and resources invested in the project. Include ideas for other areas where the FMEA action results can be used. 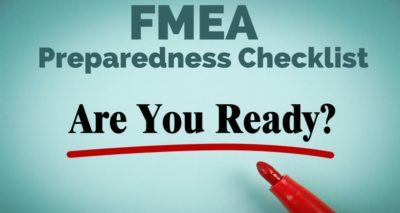 As teams work on the FMEA, chances are other potential FMEA projects will be identified, especially if the original scope of the FMEA had to be pared down; include this information in the final report. Because the FMEA is a living document, it shouldn’t be filed away never to be seen again. Instead, this final section should also include plans for follow-up on the actions taken to assure they are robust and continue to deliver the benefits as promised. Include a brief description of follow-up plans and a timetable in the summary report. 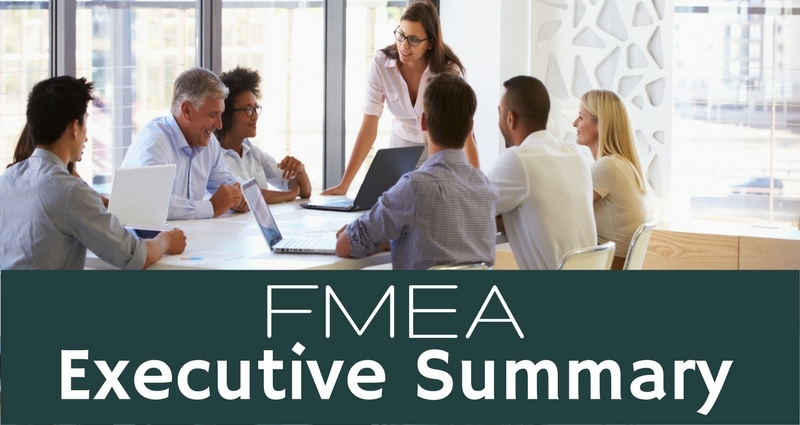 Your team may be asked to present the FMEA Executive Summary or it could go to your management team as a written report. In either case, there should be a written report. We have created a template to help your team structure this report. Ideally, when complete, it should be no more than two pages.